Lottery Funding Campaign – We Need Your Vote! THE LENTON CENTRE NEEDS YOU! 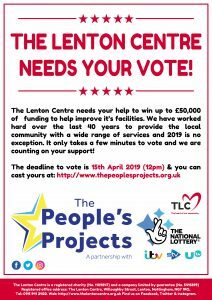 The Lenton Centre needs your help to win up to £50,000 of funding to help improve it’s facilities. We have worked hard over the last 40 years to provide the local community with a wide range of services and 2019 is no exception. It only takes a few minutes to vote and we are counting on your support!